inTRAlinea. online translation journal > Special Issues > Special Issue: Challenges in Translation Pedagogy > What Kind of Training for Literary Translation Revisers? Analysis of preliminary data obtained from a survey on the revision of editorial/literary translations in Italy has highlighted, among other things, interesting facts about revisers’ training. As regards the acquisition of revision skills, both groups of respondents – revisers and translators – gave by and large the same answer: they received little or no specific training in revision, while mostly relying on a ‘learning by doing’ approach. Interestingly, most revisers said they also work/worked as translators, thus suggesting that the lack of specific training in revision is somehow compensated with linguistic and translation competence and expertise acquired through professional practice. The didactic value of revision as a tool to acquire translation competence and boost translators’ confidence is well documented (Mossop 2001; Way 2008), however, since translators often pursue a career as revisers, it might be important to provide them with a training offer that can help them acquire revision competence as a strategic sub-competence - i.e. the ability to identify translation problems and difficulties, to consider different solutions depending on textual and non-textual factors, to evaluate translation choices and to make changes to the translation when necessary - not only with a view to improving their translation skills, but also to applying it in professional contexts. This can be done by providing translation trainees with a working method and tools that can be adapted to different publishing contexts, as well as with analytical and descriptive concepts and terms. I propose a combination of collaborative, awareness-building revision method and a starter tool set consisting of Word for Windows Revision, house-style guidelines, Mossop’s revision parameters, and Berman’s deforming tendencies, to be jointly implemented in a dedicated, ‘virtual’ revision place. ©inTRAlinea & Giovanna Scocchera (2014). "What Kind of Training for Literary Translation Revisers? Some Data and a Few Suggestions"
Over the past fifteen years or so, my personal experience with English - Italian translation and revision professional practice and the teaching of both in academic and professional contexts has taught me that while it is challenging for a translation trainer to introduce and promote the analytical skills, the critical awareness and the strategic, problem-solving frame of mind that are at the core of revision competence, it is equally hard to find good and competent revisers in the professional publishing context: professionals who can improve, correct and suggest improvements at the same time. However, as much as translation revisers are hard to come by and train, they are a key link – albeit a weak one – in the editorial chain, and they are desperately sought for in the publishing market, at least in the Italian one where strong editorial offices within publishing companies have become a rarity, and most work phases of the editorial production are outsourced to freelance professionals. In order to better understand the world of editorial and literary translation revision in Italy and to outline the main features of both its practice and practitioners, a qualitative survey was carried out with particular reference to the English - Italian language pair. Inspired by Nord (1991) and her analytical method, as well as by inputs coming from direct translation/revision experience and from collected interviews with professional translators and revisers (Manfrinato 2008; Carmignani 2008), the survey aimed at gaining insight and information on this key stage of any translation process by asking questions on the what, who, where, when, how and why of revision. This was done through two separate questionnaires (consisting of 27 open-ended questions each) aimed at both revisers working on other people’s translations (other-revision) and at translators who revise their own work (self-revision). Potential respondents were given the opportunity to access and answer the questionnaires either via the LimeSurvey online platform or via free downloadable Word files. The survey remained open for roughly two months, collecting a total of 80 complete answers from 54 translators (67.5%) and 26 revisers (32.5%) respectively. These percentages are possibly representative of the translator/reviser ratio in the Italian publishing market, although official figures regarding the number of translators and revisers involved in the Italian literary translation industry are not available as yet. Among others, respondents were asked to answer the following question: ‘In your education/training as a translator or reviser, did you attend any revision-specific courses/lectures/seminars or workshops? If so, where and for how long?’. A qualitative and quantitative reading of the data obtained shows that about 60% of translators did not receive any revision-specific training while 30% of them attended professional seminar/workshop-like events on revision. Only 10% received revision-specific lectures as part of their formal translator education. As for professional revisers, about 90% of them said they did not attend any revision-specific course and that theirs was mainly training in the field, mostly through ‘learning by doing’ and ‘trial and error’ everyday practice, rather than through formalized in-house mentoring or apprenticeship. The remaining 10% of revisers said they had some form of editorial/publishing training where revision was dealt with, but not necessarily on translations. It is important to note that answers to the questionnaires also revealed that the majority of responding revisers were or still are translators themselves, and therefore have experienced revision, either actively or passively, on their own translation work. It is fair to assume that the gap in their specific training as professional revisers is somehow filled with their training and/or direct experience in translation. 2. Why should we teach revision? ‘[…] the contrastive revision/control between the ST and the TT allows students to identify and ‘tag’ their errors and omissions and to determine, or at least to pinpoint intro- and retrospectively, the reasons and the causes of such errors, omissions or even inadequacies’ (Saridakis and Kostopoulou 2003). and also because of ‘[…] the need to prepare the translation trainees for their professional careers’ (Saridakis and Kostopoulou 2003). In other words, revision practice surely represents an important didactic resource in translator education and training towards the acquisition of psychological, interpersonal and strategic sub-competences, but it may also be a core content to develop if we are to meet market demands for competent, professional revisers. The fact that such a challenge is being acknowledged in newly emerging translation markets, such as the Machine Translation one, where ‘post-editing skills have […] become an important component of professional practice and specific training is required to meet the demands of the market’ (Alves 2013) should be an incentive to do the same in the literary translation sector. In fact, when considering that revision is a powerful rhetoric tool in written composition instruction at all levels, from primary school to college courses, and understanding translation itself as a form of creative, literary writing as advocated by Levý (2011), one would legitimately expect revision to play a much more prominent role in literary translation education and training curricula. Unfortunately, a brief and preliminary overview of what is on offer, at least in Italy, seems to indicate quite the opposite. Two main translation curricula exist in Italy which, despite going under different names, share similar course descriptions and career prospects. In their manifestoes, revision is indicated both as an activity practised within the course and as a potential professional career. However, revision does not appear either as a taught module or a topic, with only very few exceptions. It is not coincidental that these few exceptions are short in-module courses lectured by high-profile professional literary translators. As for the vast majority of courses and modules within these two translation curricula, revision seems to be taken for granted as a component of any translation class, even though the answers of the above questionnaires have indicated a different situation altogether. There are also post-graduate one- or two-year courses, both in public and private institutions, whose main objective is to provide an overview of the editorial process in all its working phases, including the text processing chain, also meaning revision and editing work. Unfortunately, there is very little room for revision of a literary translation, and maybe rightly so, as students of such courses are not necessarily translation specialists and therefore are not supposed to have the linguistic, cultural and translational competence to deal with such a task. However, referring back to the above questionnaires, those few professional revisers who said they had some revision-specific training, referred to this kind of opportunities. Finally, there is a rising number of seminar/workshop training opportunities, mainly run by professional revisers working freelance or in-house, which can cater for a wide range of training revision needs and are attended by translation students, novice translators, professional translators and revisers. Usually they are one or two-day courses mainly focusing on revision practice and providing examples taken form real-life professional situations. 4. What do we need in revision education/training? and finally, the need for a collaborative approach in revision practice and the creation of virtual places where this collaboration may effectively take place. In an attempt to meet, at least in part, the needs listed above, and acknowledging revision as a comparative, corrective, ameliorative, constructive, formative and collaborative activity (in line with a new and comprehensive overview of revision definitions provided in Scocchera 2013), with particular reference to other-revision practice in literary translation, the proposal introduced here and applicable to both formal education and professional training contexts seeks to promote and combine the above six dimensions of revision practice in a synergy of dedicated method, tools, and place. In particular, the proposed method aims at gradually introducing theoretical and practical content and skills while allowing students/trainees to acquire revision awareness and know-how, and to effectively use both in other-revision practice. The critical, analytical and descriptive method they are asked to apply to other people’s translations is conducive to increased awareness of strengths and weaknesses in their own translation output. Moreover, the acquisition of revision competence as an interpersonal and strategic sub-competence can turn into an asset in both translator and reviser future careers. As for the revision tools, they have an analytical, corrective, argumentative and operational function, and they can be expanded, adjusted, and customized depending on such variables as text genre, target audience, specific house-style guides or other publishers’ requirements. Finally, the revision place is here intended as a ‘virtual space’ where both method and tools can be easily integrated, allowing collaborative work on texts not only in educational and training contexts but also in the professional practice. Drawing from long-established theories on the translation process and literary texts (Holmes 1994; Hönig 1991; Jakobson 1987), the method here proposed is not serial or sequential in nature, but rather structural and recursive, as typical of any translation and revision process. Revision education and training with a group of translation students or professional translators/revisers will ideally start by exchanging and sharing ideas on the reception of the ST on different levels or planes (i.e. structural, linguistic, stylistic, cultural, functional and editorial) in order to develop a mental map and identify its overall ‘dominant’ or ‘dominants’. The same analytical approach will be applied to the translated text, whose identified mental map and dominant/s will be compared to that of the ST, highlighting corresponding and equivalent features or shifts at any level. This contrastive activity will allow to formulate a mental map and dominant of the revision activity which will then serve as guiding principle for the analysis and description of translation problems or shortcomings, the constructive and argumentative suggestion of alternative revision strategies and approaches, and the introduction of actual revision input (through correction, suggestion, enquiry, acknowledgement, validation) with the use of revision tools. What happens in the students’ minds during the cognitive, decision-making process appears in the form of changes tracked and/or comments. The product of this preliminary revision activity will then be discussed in class to assess its conformity to the revision dominant/s previously identified: at this point, peer exchange, collaboration and dialogue are encouraged, thus reinforcing students/trainees’ ability to motivate, justify and ultimately defend their revision approach and strategy. This activity can be recorded as students’ comments on the translation, thus recreating a real-life situation where translators negotiate their strategies and decisions with revisers and copy-editors. The output of this collaborative phase will be a shared formulation of the revised TT. In other words, the method is based on the definition of the author’s poetics, the translator’s poetics and the reviser’s poetics and their relationship with extra-textual factors, such as publisher’s specifications and demands, market and readership’s requirements. The collaborative approach allows the translator’s and reviser’s poetics to enter into a dialogue, to exchange and share views, to agree or disagree on strategies and solutions. The corrective and constructive tools here proposed (Microsoft Word Revision Tool (1); publishing company house-style guide or other specific publisher’s requirements (2); Mossop’s revision parameters (3); Berman’s deforming tendencies (4)) are both operational tools, i.e. they allow work on the translated text by way of additions, deletions, substitutions, comments, and descriptive tools, i.e. they allow analysis and explanation of translation issues and problems and their proposed revision. They are gradually introduced, starting with the most ‘impersonal’ tool (Microsoft Revision) to the one requiring well-tuned critical skills (Berman’s deforming tendencies). After being illustrated in all its functions and purposes and its corrective, constructive and analytical/descriptive potential, each tool is shown in its actual application on a revised translation (preferably a real-life translation task), then students/trainees are asked to practise with it in other-revision modality. Over a semester course, students/trainees will have started to interiorise both the method and tools in such a way as to turn them into a personal resource, ready to be used in self-revision, too. As for tool (1), one should note that it is not the only text editing option on offer, but it is one of the best known by both students and professionals. Its basic functionalities are quite straightforward, and they can be optimised and adjusted to suit different revision requirements depending on the context and intended use (academic or professional), and the translator/reviser relationship (for example, the use of different colours to highlight different problem categories; the possibility to decide whether to track or non-track the changes made; the opportunity to add comments; the possibility to view the text as a work in progress or as a final version). As concerns tool (2), in addition to compliance with house-style guidelines, revision may also have to meet other requirements as specified by the publisher, for example conformity to an existing catalogue, to a genre-related canon, or to the linguistic and encyclopaedic knowledge and expectations of a particular target audience. Publishers’ guidelines mainly refer to formal aspects of the text and there are agreed editing conventions which may vary depending on the publishing house. What is important is to adjust the translation and its revision to editing standards. Revision acts intended to comply with such guidelines are to be treated as actual ‘corrections’, not ‘suggestions’ and as such, they need little or no explanation. When dealing with literary texts, however, deliberate deviation or innovation in editing conventions and standards in the ST (zero punctuation, unmarked dialogues or other idiosyncratic elements) should be detected and treated accordingly in the TT and its revision, even if this means non-conformity with house-style guidelines. In this case, close collaboration between translator, reviser and copy-editor is paramount. Besides representing an excellent guide when doing revision practice focused on particular textual aspects or translation problems, as well as a useful checklist for self-revision, tool (3), that is the parameters indicated by Mossop in his Revising and Editing for Translators (2001) also provides a valuable terminology repertoire for the analysis and description of the revision activity, both in the didactic and professional context. Mossop’s twelve parameters are grouped into four categories corresponding to as many problem-areas: transfer (problems regarding Accuracy and Completeness of the ST message); content (problems regarding the inner Logic of the text and the correctness of Facts presented); language (problems regarding Smoothness and readability, Tailoring for a specific readership, Sub-language required for a specific genre or specialist area, correct use of Idiom, correct Mechanics of the target language, i.e. grammar, spelling, punctuation, etc. ); presentation (problems regarding Layout, Typography and physical Organisation of the TT). When applying these revision parameters, it becomes very clear that a translation can be revised for different reasons and purposes and to different extents; it may work perfectly in some aspects and be lacking in some others. The parameters cover all aspects of a non-literary translation revision, but do not account for typical features of literary texts, such as word sounds and rhythm, author’s style or literary genre. This is why, in the particular case of literary translation revision the introduction of, at least a fourth tool, was necessary. Identified by Berman (1999) in his ‘negative analytic’ and seen as operating in most European’s translated literature, these twelve tendencies (tool (4)) are the expression of an ethnocentric approach to translation, where the ST is naturalised into the receiving culture at the expense of its foreign qualities. They pinpoint simplifying attitudes (Rationalization and Clarification) often leading to verbose rephrasing (Expansion), unjustified register uplift (Ennoblement), downgrading (Qualitative and Quantitative impoverishment), cancellation of textual and linguistic features (Destruction of rhythms, Destruction of significant networks, Destruction of linguistic patterning, Destruction of vernacular or eroticisation, Destruction of idioms) and homogenisation (Effacement of superimposition of languages). The general domestication vs. foreignisation dichotomy has a very long tradition indeed, from Cicero’s sensum vs. verbum to Venuti’s domestication vs foreignisation. One can agree or disagree with the ethical implications in choosing one approach or the other; however these deforming tendencies represent a valuable analytical and descriptive tool in literary translation revision. They can be used to identify and categorise translation issues, problems and shortcomings and prompt the revision activity by attempting to counterbalance and reverse them. In order to see both the revision method and tools at work, here is a real-life example of student’s coursework on revision as carried out after a semester course at the School of Languages, Literature, Translation and Interpretation of Bologna University at Forlì. This same didactic approach has been used in shorter professional training seminars. What we see here is a combination of the different tools at work together with an analytical-descriptive-argumentative revision activity explained in the comments, using terminology drawn from house-style guidelines, Mossop’s parameters and Berman’s deforming strategies. You can also see the use of different colours to highlight the tutor’s comments in agreement or disagreement with the student reviser’s approach or solution. A final, overall comment (not included in the screenshot above) illustrates the student’s preliminary work of ST and TT dominant identification as required by coursework specifications. The use of a set of objective tools to operate and describe the revision activity has proved beneficial also in terms of students’ assessment. Students were informed beforehand that the final mark awarded to their work would come out as the summative evaluation of different parameters, namely the correct use of the Revision tool, the correct application of the house-style guidelines, the use of proper terminology to highlight, describe and comment translation problems and shortcomings, the ability to offer corrections and/or suggestions and to explain/justify them with proper terminology, and finally the overall ability to distinguish between corrections and suggestions and to track down all translation/editorial shortcomings. As evident from the example above, revision fits ‘uncomfortably’ in the limited space of a Microsoft Word file. Moreover, if we are to encourage an interpersonal and collaborative approach throughout the translation/revision process – not only in the didactic context but also as a professional mode of communication between author/translator/reviser/publisher – the need is felt for a more spacious ‘home’ where revision can take place. To meet this need, new projects are currently being developed in the field of editorial/literary translation, whose collaborative dimension is particularly strong. In the ‘PEnPal in Translation’ project, where PEnPal is the acronym for Portuguese/English Platform for Anthologies of Literary Translation, the emphasis is on the didactic and formative value of peer work in the revision stage, towards the acquisition of a global translation competence. Strongly relying on IT, CAT tools and free web access, the main components of the project are ‘a blog especially designed to share and discuss translation issues, and a database devoted to the systematisation of such issues’. Similarly to the ‘add-comment’ function in Windows Revision Tool, the blog offers a bigger place to verbalise and share insights on translation issues and on the translation process itself, an opportunity which the project developers ‘believe will prepare practitioners to solve their issues and make conscious decisions’. Moreover, while focusing on didactics, publication of the resulting translation output is not excluded. A second, interesting project called TLHUB – Translation and Literary Hub – has been recently promoted by the European Society of Authors and supported by various academic and non-academic institutions. Here, emphasis is placed less strongly on didactic applications; however the ‘open’, adjustable nature of the project and its tools is such that it can be tailored to meet different needs in formative and professional contexts. The aim of the project is to create a dedicated technological platform to facilitate collaborative dialogue and exchange between all the agents involved in translation, namely authors, translators, revisers, translation students and translation lecturers. While offering limited editing tools to physically work on text, the platform strongly encourages a peer-to-peer approach between translator and reviser, where both roles can be taken up by either translation students or translation lecturers. What may, at first, appear as a limitation of the project, i.e. very basic editing tools, is in fact, a clear statement of the way in which translator/reviser interaction and collaboration is understood: not necessarily, or not only, a corrective and/or ameliorative manipulation of the translated text, but an in-progress, constructive discussion and exchange of translation strategies and solutions. Use of this platform in didactic contexts may be particularly effective in post-graduate and masters courses, where students should have already developed good critical and analytical methods and skills, but its application would be highly beneficial in professional contexts too, because it would foster a less hierarchical and more collaborative relationship between the agents of the translation process and between translator and reviser, in particular. Officially launched in October 2013, this tool already has its first institutional users in the NYU’s Translation Studies Department, Université Paris-Diderot and Paris 8’s Masters programme in Literary Translation. A brief mention was made earlier to literary translation being understood as a form of literary writing. With this in mind, an interdisciplinary interest in the rhetoric of written composition, with revision as a key tool throughout the history of literature and publishing, should be encouraged. In fact, an in-depth analysis of revision tools, techniques and methods as applied in original writing instruction, as well as the study of the historical and cultural development of revision as part of the publishing process, would be highly beneficial to both the process and product of literary translation and to revision teaching and training. More importantly, being able to view and access the different creative stages of an original written composition would be a valuable opportunity for any translator and reviser. The idea is that seeing how the ST’s author revised his/her own text, understanding his/her creative approach and analysing revision additions, omissions and substitutions over time can help both the translator and reviser to develop their own translation/revision process and to consciously decide on translation/revision strategies and solutions. Similarly, translation ‘interim versions’, as well as other records of the creative process of translation (commentary, retrospective analysis and/or interviews), have been indicated as precious, underexploited material for the study of the translation process and the translator’s decision-making activity (Munday 2013; Siponkoski 2013), and may also offer interesting insights on publishing requirements at a given time and within a given culture, as well as on compliance with target readers’ expectations. Self-revised manuscripts or drafts, however, tend to be difficult to analyse and therefore pose methodological problems in research. But where collaborative revision exists and leaves a trace on the translation work– either in the form of revised Word files with comments and suggestions, retrospective records or other – it may produce a wealth of research material if we are to study both the translation process and product. In particular, revision didactics could greatly benefit from a comparative analysis of the way students and professionals verbalise their revision actions, thus allowing better understanding of how analytical and critical attitudes are built and enhanced over time. To allow further investigation on these lines, a new synergy between IT tools and the needs of literary translation practice and teaching should be pursued so that technological software and platforms already available may be tailored to meet specific research, didactic and/or professional requirements. Collaborative translation environments are fertile ground for the development of collective writing, editing and commenting tools that can be beneficially applied to translation and revision teaching. Existing softwares are mostly open-source and provide innovative solutions for original/translated writing (Scrivener, TLhub, Traduxio), collaborative editing (Etherpad, Piratepad), annotation and assessment (Co-ment, Proofreader Marks Add in, Markin), text analysis and criticism (Juxta). These are only few examples of the way in which technology and humanities may join forces and blend towards the creation of new models, methods and tool in translation and revision teaching and training. This paper raised and tried to illustrate key issues in translator education, with particular reference to revision of literary translations as teaching content within both academic and professional environments. It invites further research and investigation not only in translation didactics but also into revision and editing as key rhetoric tools of original written composition instruction and in the possibility of blending new, innovative, technological opportunities to literary translation and revision teaching and practice within a collaborative framework. Hopefully, the central role of revision in any writing process has been made clear, so much as the didactic/training value of revision practice in the development of translation competence at large. Drawing from information on current trends in the literary translation industry, the paper also tried to emphasize the value of good revision skills as a competitive asset in professional publishing, underlining at the same time an urgent need for more education/training opportunities in revision, particularly when applied to literary translation. In order to make revision teaching effective, ad-hoc tools and methods should be developed in an interdisciplinary approach, blending technology and humanities. Dedicated efforts in revision teaching research might result in the development of specific revision language and terminology for communication within teaching and professional contexts. All this will contribute to promoting revision as an interpersonal and collaborative activity, both within and outside the translation classroom. Allen, Esther, and Bernofsky Susan(eds) (2013) In Translation, New York, Columbia University Press. Berman, Antoine (1999) La traduction et la lettre ou l’auberge du lointain, Paris, Éditions du Seuil. Carmignani, Ilide (ed.) (2008) Gli autori invisibili. Incontri sulla traduzione letteraria, preface by E. Ferrero, Lecce, Besa. Chesterman, Andrew and Emma Wagner (2002) Can Theory Help Translators?, Manchester, St. Jerome Publishing. Holmes, James S. (1988) Translated! Papers on Literary Translation and Translation Studies, Amsterdam, Rodopi. Hönig, Hans G. (1991) “Holmes’ Mapping Theory and the Landscape of Mental Translation Processes” in Kitty M. van Leuven-Zwart and Ton Naaijkens (eds) Translation Studies: The State of the Art, Amsterdam, Rodopi. Horguelin, Paul A., and Louise Brunette (1998) Pratique de la revision, Quebec, Linguatech. Horning, Alice S.(2002) Revision Revisited, Cresskill, NJ, Hampton Press. Horning Alice S., and Anne Becker (eds) (2006). Revision: history, theory and practice, West Lafayette, Indiana: Parlor Press and the WAC Clearinghouse. Jakobson, Roman (1987) “The Dominant”, in Language in Literature, Pomorska, Krystyna and Stephen Rudy (eds), Cambridge (MA)-London, The Belknap Press of Harvard University Press. Kelly, Dorothy (2002) “La competencia traductora: bases para el diseño curricular”, Puentes, 1, January 2002, pp. 9–20. Kussmaul, Paul (1991) “Creativity in the Translation Process: Empirical Approaches” in Kitty M. van Leuven-Zwart and Ton Naaijkens (eds) Translation Studies: The State of the Art, Amsterdam, Rodopi. Levý, Jirí (2011) The Art of Translation, trans P. Corness, Amsterdam/Philadelphia, John Benjamins Publishing Company. Manfrinato, Chiara (ed.) (2008) Il mestiere di riflettere. Storie di Traduttori e Traduzioni, Roma, Azimut. 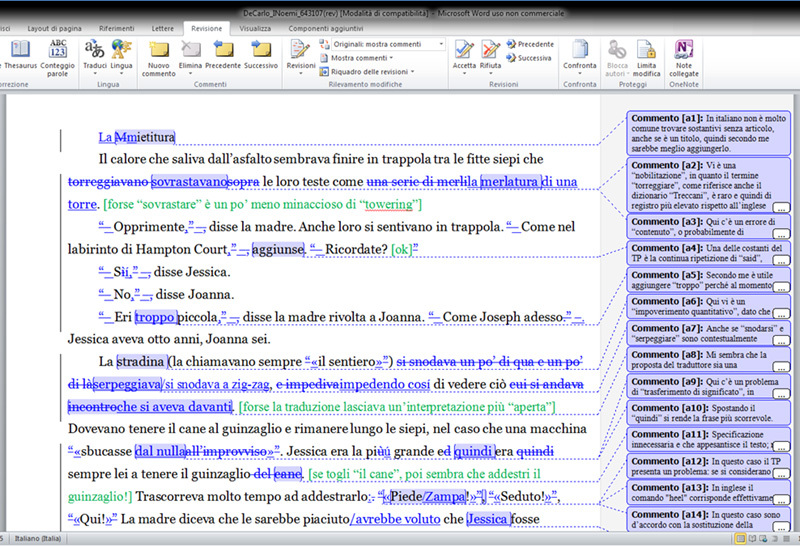 Mossop, Brian (2001) Revising and Editing for translators, Manchester, St. Jerome. Nord, Christiane (1991) Text Analysis in Translation: Theory, Methodology and Didactic Application, Amsterdam, Rodopi. PACTE (2005) “Investigating Translation Competence: Conceptual and Methodological Issues”, Meta, vol. 50, n.2, pp. 609–619. Schäffner, Christina and Beverly Adab (eds) (2000) Developing Translation Competence, Amsterdam/Philadelphia, John Benjamins. Scocchera, Giovanna (2013) “What We Talk about When We Talk about Revision: A critical overview on terminology, professional practices and training, and the case of literary translation revision in Italy”, in FORUM, vol. 11, n.2. October 2013, pp. 141–174. Sullivan, Hannah (2013) The work of revision, Cambridge, MA/London, UK, Harvard University Press. Toury, Gideon (1980) In Search of a Theory of Translation, Tel Aviv, The Porter Institute of Poetics and Semiotics. Way, Catherine (2008) “Bringing Professional Practices into Translation Classrooms”, Proceedings of 8th Portsmouth Translation Conference, Portsmouth, UK. All the tools proposed – both operational and analytical-descriptive ones – can be expanded, adjusted and upgraded to accommodate specific revision needs and modalities. In particular, the author is currently researching on how traditional theoretical content – especially classification categories, descriptive concepts and critical approaches – can blend with innovative, computer-based and web-based editing, commenting and collaborative tools. The four categories are italicized and the twelve parameters are capitalized. English into Italian to be discussed in 2015. Her research interests are revision terminology, revision competence definition and acquisition and revision as a collaborative activity.